Last modified on October 9th, 2018 by Vincy. 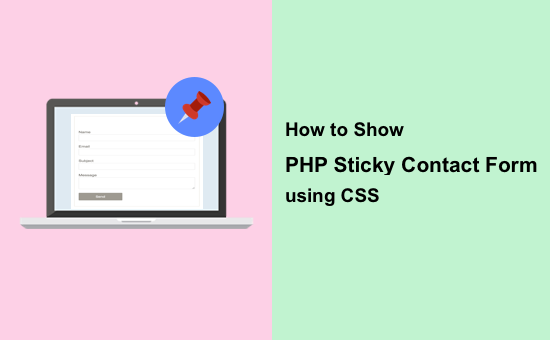 To provide an easier way for your users to reach you the PHP sticky contact form will be useful. By making an element sticky in a web page, it will be made fixed in a specified position and visible even on page scroll. Generally, the sticky component of a website will show the content that needs the highest possible visibility. For example, navigation menu, up down vote controls, social share icons and many. Check the simple secure spam-free contact form Iris to increase contact rate and in turn boost your sales. In a previous tutorial, we have seen how to display sticky social icons using jQuery. In this example, we are going to use only CSS to make the PHP contact form as a sticky element of a webpage. A two-column webpage contains the sticky contact form in its right sidebar. An external stylesheet with the combination of CSS selectors drives the sticky display of the contact form. This HTML code is used to display a two-column template. The sticky contact form is added to the right sidebar. The left column will display the main content. The style.css included in this HTML drives the stickiness of the contact form. 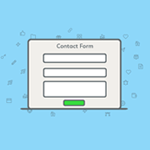 In this section, I have added the validation script used to handle contact form field validation on submit. This is the CSS added to the two column webpage. The style.css file contains styles for designing a two-column webpage with a contact form in its sidebar. This also includes the styles to make the contact form container as a sticky element on page scroll. On submitting the contact form, the form data are posted to the PHP. In the PHP code, it receives the contact data and sends it via an email. In a previous tutorial, we have seen how to send contact data with attachments. In this PHP code, I have used the PHP in-built mail() function for sending the contact mail. If you are looking for the mail sending script using Gmail SMTP, the linked article has the code. 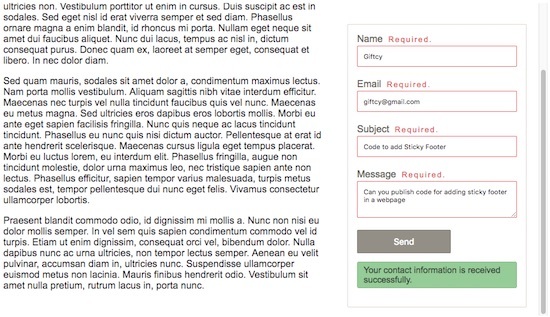 This screenshot shows the sticky contact form in the right sidebar of a two-column template.